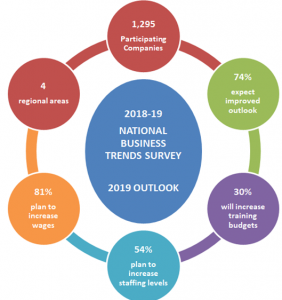 LONGWOOD, FL – Employer Associations of America (EAA) released its 2019 National Business Trends Survey. This year’s survey indicates a fair amount of “optimism” on the part of business executives for 2019. Nearly 74% describe their projected 2019 business outlook as a slight to significant increase in sales/revenue. Supporting that optimistic outlook is the fact that 54% of executives surveyed plan to hire permanent staff in 2019. When asked the primary reasons for their 2019 hiring plans, 72% said their hiring will be to fill newly created jobs. When asked which strategies executives are using to overcome recruitment and retention challenges, respondents identified: adjusting pay ranges upward, focusing on existing staff receiving additional training and development, and increasing starting salaries as the top strategies. In addition, due to the tight talent shortage, a survey question was revised for the 2018/2019 survey to determine the top five most important factors prospective employees are looking for to assist employers with recruitment and retention. The top 5 factors employees selected included: 1. competitive pay (82%), 2. good work/life balance (69.2 %), 3. flexibility in work hours (56.1%), 4. opportunities for advancement (55.4%), and 5. competitive health benefits (49.9%). In addition, the EAA 2019 National Business Trends Survey breaks results out on a local level as well. In this region, respondents identified talent acquisition as a serious challenge to their business. “EAF partners with specialists in the staffing/recruiting industry to help our members find qualified employees in this tight labor market,” said Rita Manny, President of Employers Association Forum, Inc. (EAF). EAF members can access the full report by logging into the members -only section of the EAF website. The Employer Associations of America (EAA) is a not-for-profit national association that provides this annual survey to business executives arming them with insights and trends for business outlooks, business investment plans, staffing levels, hiring plans, job creations, pay strategies and business challenges. The 2018 Survey included 1,295 participating organizations throughout the U.S. The EAA consists of 32 regional employer associations serving 35,000 companies and more than six million employees. Regional employer associations are dedicated to serving their members as trusted partners that help members maximize the performance of their employees and their organization through business expertise in compliance, recruitment, retention, surveys, safety, training, and organizational development. EAA’s mission is to advance a national presence and to promote local success among members through unparalleled collaboration, excellence, and efficiency. To learn more about the EAA, visit http://www.eaahub.org.